Using someone else’s recording in your music without permission can lead to disaster. We explain the ins and outs of copyright law, and guide you through the process of clearing your samples. To sample or not to sample? This is the question many a DJ, producer, and songwriter must grapple with on an almost daily basis. Sampling is fun, and in the era of the ubiquitous digital audio workstation, very easy to do. But is it always a clever move from a legal and business perspective? In this article we’ll consider how to go about sampling within the law, how to avoid getting sued, and consider some of the pitfalls of falling foul of copyright law. Sampling involves the incorporation of another sound recording into your own new record. A producer may sample an underlying element in a record — for instance a string or bass line, perhaps borrow a drum loop, or even lift several bars wholesale from a classic soul record — and write a chart–friendly melody over the top. The creative act of sampling is nothing new. Much of the Beatles’ late–’60s output owes a great debt to the sound–collage and tape–splicing artistry of production legend George Martin. Nor should sampling be a worry, when the primary source of the sample is self–created. Be it a vocal drone, birdsong recorded and cut up into your dance tune, or as in the case of the Nile Rogers’ inspired vocal stutter, ‘No... No... Notorious’. Rodgers had sampled Duran Duran’s vocals and edited them into an immediate radiotastic hook, as he’d already done on 1984’s pitch–shift sampled intro to ‘The Reflex’. Modern–day producers such as Timbaland and Pharrell Williams aren’t averse to incorporating their own homegrown beat–box elements into major airplay hits. The Williams–produced ‘Rock Your Body’, for instance, is liberally peppered with Justin Timberlake’s own down–the–mic percussive elements. The legal headache, as far as the producer, artist or songwriter is concerned, stems from using another person’s original sound recording without prior permission, since this constitutes copyright infringement. The act of sampling without permission infringes copyright in three distinct ways. Firstly, it is a breach of copyright in the original sound recording. Secondly, it is a breach of copyright in the underlying music and lyrics, and thirdly, it constitutes an unauthorised use of one or more of the performances in the original work, such as a guitar riff, vocal hook, or drum part. In addition, the moral rights of the original artist may be infringed, if sampling is undertaken in a way that the artist objects to, or if the artist isn’t credited. In UK law, under the Copyright Designs and Patents Act 1988, in order for infringement to take place a ‘substantial part’ of a copyright work must have been used. Substantiality in UK law differs somewhat from its US counterpart, the doctrine of ‘substantial similarity’. Moreover, US copyright law permits the defence of ‘fair use’, which has been invoked in a number of recent cases, although not always successfully (see ‘Case Dismissed’ box). Regarding the question of whether a ‘substantial part’ has been copied, the UK case of Produce Records Ltd vs BMG Entertainment Ltd (1999) established that a 7.5–second sample of ‘Higher And Higher’, a track originally recorded by the Farm and owned by Produce Records, constituted infringement when appropriated by veteran Latino duo Los Del Rio, for their summer hit ‘Macarena’. BMG settled the case out of court, thus avoiding trial, with the major label appearing to concede that Produce had an arguable case. 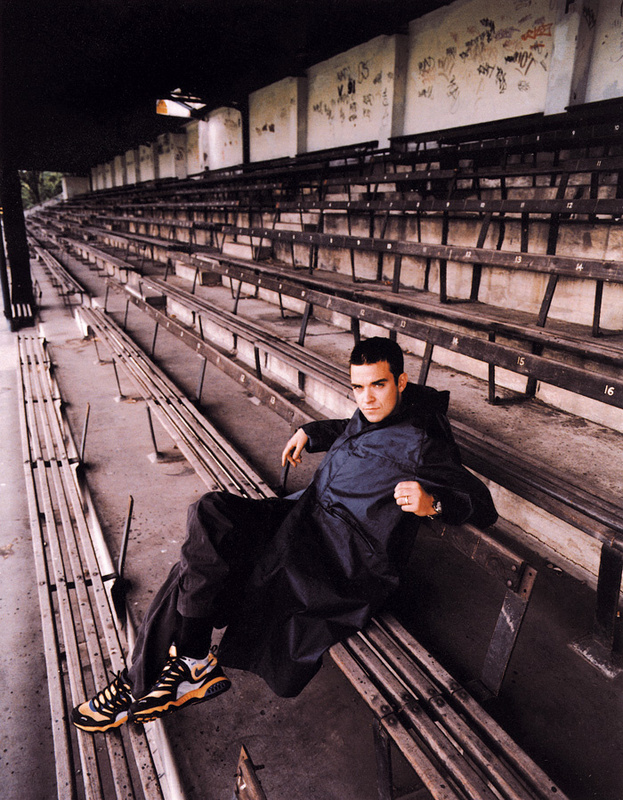 Robbie Williams blends into the crowd at a Stoke City home match.In Ludlow Music Inc vs Williams (2000), a two–line lyrical ‘sample’ of the song ‘I’m The Way’, written by Loudon Wainwright III and published by Ludlow Music, formed the basis of a copyright dispute, when Robbie Williams used very similar lyrics in his own song ‘Jesus In A Camper Van’ — there was no use of the original recording, so the dispute only concerned copyright in the song itself. At considerable expense to the record label, the judge ruled that the Robbie song be removed from all future pressings of his album I’ve Been Expecting You. Robbie also lost out on 25 percent of the publishing income on ‘Jesus In A Camper Van’ to Ludlow Music, a figure said to be somewhere in the region of £50,000. Every Son of God gets a little hard luck sometimes, especially when he goes round saying he is the way. I suppose even the Son of God gets it hard sometimes, especially when he goes round saying I am the way. Over the pond, the recent US decision by the Sixth Circuit in Bridgeport Music vs Justin Combs Publishing (2007), confirmed copyright infringement liability against Sean ‘Diddy’ Combs and his Bad Boy record label. This case concerned the title track from The Notorious BIG’s 1994 album Ready To Die, which sampled the song ‘Singing In The Morning’ by ’70s funk outfit the Ohio Players. The Biggie record sampled just five seconds of horns from ‘Singin’ In The Morning’, but very bad boy Diddy had failed to obtain a licence for its use. The song’s copyright owners Bridgeport Music and Westbound Records sued for infringement, with a US jury awarding $733,878 in damages to Bridgeport, and punitive damages of $3.5 million to Westbound. Allowing common sense to prevail, the trial judge overturned the award, ruling instead that Bridgeport should receive $150,000 in statutory damages, with Westbound receiving $366,939 in actual damages. Still, that works out at over $100,000 per second of music — a brief yet very costly mistake! Dr Dre, another big name from the US urban scene, has also spent his fair share of time in the legal spotlight. In 2003, Indian composer Bappi Lahiri and Saregama India Limited sued Dre and Universal Music for $500 million, over the use of an unlicensed sample on ‘Addictive’, the debut single from Truth Hurts’ album Truthfully Speaking. Dre was also slapped with an injunction preventing the continued sale of the record, which by then had already shifted over 200,000 copies. Dre and his producer DJ Quik had used a sample of an old Hindi song, ‘Thoda Resham Lagta Hai’, without permission from the Indian copyright holder Saregama. The plaintiffs alleged that in addition to ‘borrowing’ the distinctive vocals, Dre and Quik had helped themselves to the hook, the melody and the rhythm. Dre has also recently incurred the wrath of one Madge Ciccone. Madonna’s publishing company are up in arms over Dre’s alleged copying of her 1983 hit ‘Holiday’ on the single ‘Not Today’, featured in the film Barbershop 2. They are demanding a refund of £7m from Dr Dre and his collaborators, artists Mary J Blige and rapper Eve. The publishers allege that parts of ‘Not Today’ include “several obvious instances of reproduction”. Not all court cases go in favour of the copyright holder (see ‘Case Dismissed’ box), but it’s always advisable to obtain a licence and permission from the copyright holder before sampling another’s work. Moreover, what may be acceptable in one country may constitute an outright infringement of copyright in another, and defences such as ‘fair use’ are not universally available everywhere. This needs to be borne in mind when releasing records internationally. So which rights should you be concerned with when sampling? Even if you believe you can process, edit, or otherwise disguise a sample in the mix, you still need permission to sample. This means that the producer or artist must first gain sample clearance from the record label for use of the original sound recording and featured performances. Usually, you will also need permission from the publisher(s) for the use of the underlying composition (ie. the words and music). If copyright wasn’t originally assigned to a record label or publisher, then you’ll need to track down the respective copyright owners — or their heirs, if deceased — and seek their permission instead. 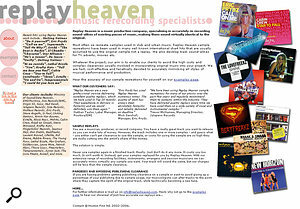 Where, for example, a song has a number of co–writers or publishers, this is no easy task. 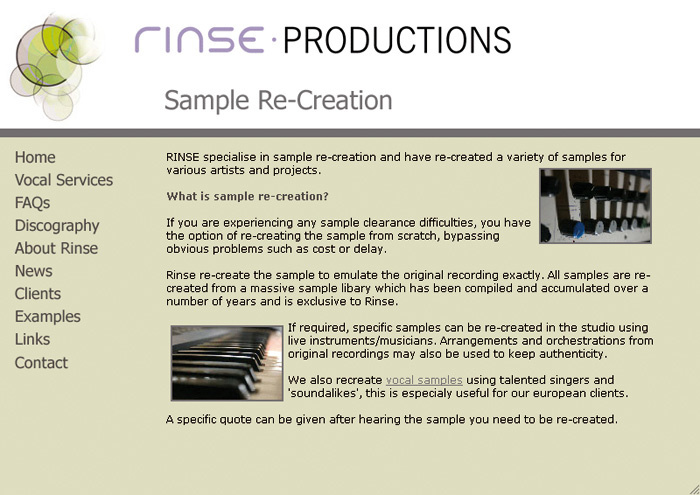 Alternatively, you could employ a sound–alike company to recreate the sample you’re after (see the ‘Recreation Grounds’ box). In this case you wouldn’t be infringing an original sound recording copyright, and would only require one set of permissions from the publisher of the music and lyric. It’s ironic that in an era of rampant piracy and the downloading of ‘free’ music, those making records still need to clear and pay for samples — whereas the end consumer can enjoy an entire album free of charge. Still, as a business–to–business activity, sampling is a lucrative business for those companies sitting on valuable copyrights, and in corporate–speak, can often give rise to valuable ‘synergies’. 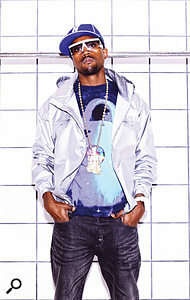 Kanye West, like many hip–hop stars, has used sampling extensively in his work.Witness the recent release of Sean Kingston’s ‘Beautiful Girls’. Not only did Sony/ATV–signed writer Jonathan Rotem help write and produce the track, but the song sampled the Sony/ATV–owned Ben E King classic ‘Stand By Me’. The fusion of old recordings and modern technology helps publishers to safeguard future revenue streams by creating such chart–friendly hybrid copyrights. 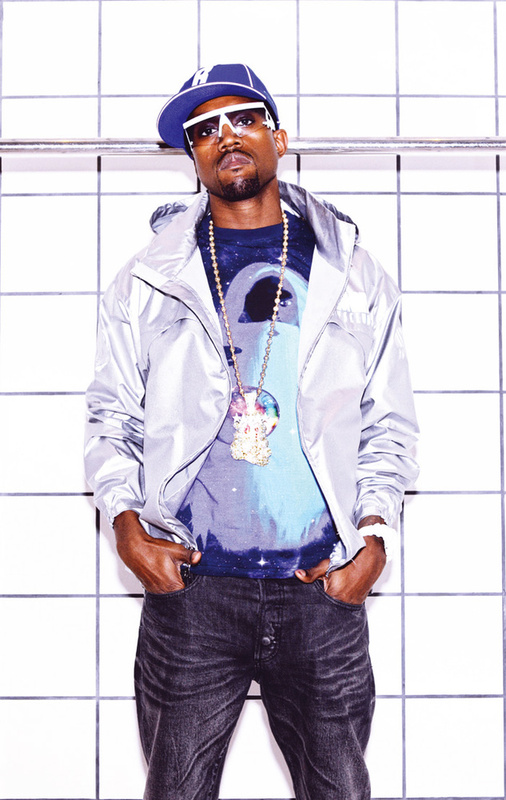 Rapper Kanye West has also topped the charts with his latest album offering Graduation, but much of the album’s royalties will actually find their way into the pockets of ’70s acts Steely Dan and Elton John, thanks to West’s bountiful sampling of these artists. Should you fail to clear the original sample before releasing your own record, you may be faced with a number of unwelcome legal consequences. You could be sued for damages for copyright infringement and face an injunction stopping you from continued sale of any infringing copies, as well as having to recall and destroy any CDs or DVDs incorporating uncleared samples. Your record label could even lumber you with the costs of this remedial work. If you produce or remix records for other artists, it’s usually your responsibility to clear any samples introduced during the recording process. The artist or their label will probably make you contractually responsible for doing so as a pre–condition of accepting delivery of the final record. Where the record label asks or insists that you include a particular sample, you should request that they pay for the related clearance costs. In other cases, sampling will add to the overall recording cost, and may be deducted from your earnings unless agreed otherwise. If you already have a record deal, then you’ll need to address the issue of whether any sample clearance fee, royalty payment or advances paid to third–party copyright holders should be recoupable from your own royalty earnings, or whether the record company should split all or some of the expense. Some labels take the view that sampling costs are part of recoupable recording costs, whereas others take a softer line. However, it’s never advisable to ignore the issue and release a record carrying uncleared samples. Further down the line, the record company may invoke the artist’s warranty clause in the recording contract and set about recovering sums direct from the artist, should the label be sued for copyright infringement. During recording sessions, producers and artists should keep detailed notes of samples used, along with their source, and their timings on the record. This can be used for notification purposes on delivery of your final mix. It’s also sensible for producers and writers to hire out their services through a limited company, then through an employment agreement with this new company, assign copyright in the songs that they produce. Should they be sued for millions in a copyright infringement claim, they’ll then be protected from personal bankruptcy! In more general terms, in order to clear samples you can either use a sample–clearing company to assist you, or do the job of gaining permissions yourself. Sample–clearance companies such as Sample Clearance Services Ltd (www.sampleclearance.com) can often negotiate better rates than individual producers or DJs. Such companies can sometimes assist in providing legal advice and expertise in dealing with overseas labels and publishers, and may also be able to clear all future uses of the sample. Where, for example, your club tune crosses over, and you find you have a hit on your hands, you would then be free to license the record for film, TV, Internet or advertising usage, without seeking further licences. Sample–clearance companies usually charge a flat rate: for example, Sample Clearance Services’ web site states that their “standard fees for sample clearance are £275–£300 per clearance”. 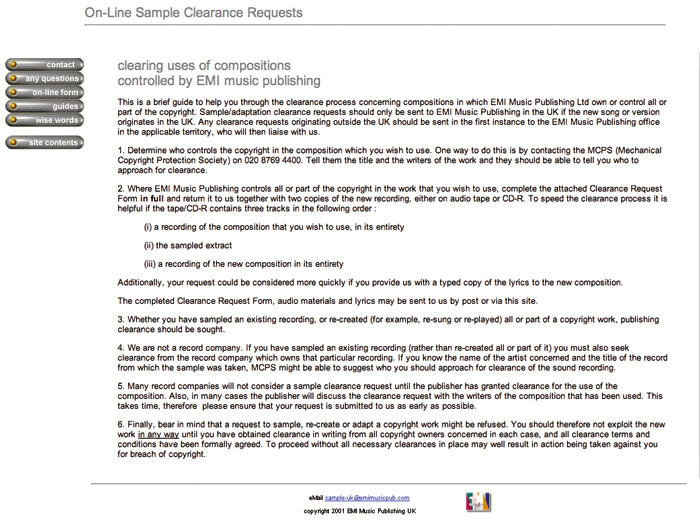 Bear in mind that one sample may require two clearances: one for the sound recording and another for the publishing. 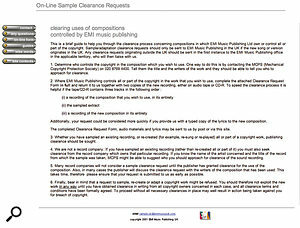 Whether you use a clearance company or the DIY route, these steps should be taken: Major music publishers such as EMI are used to dealing with requests for sample clearance and have procedures in place to streamline the process. The publisher of the original work must be contacted. You’ll need to find out who the original writers of the work are, and which publisher(s), if any, represent their interest or share of copyright in the song. In the UK, the MCPS/PRS can help you with this. They operate a vast database of registered works, and also have a sample–clearance team to assist you. Once you know the publisher and authors, you provide them with a copy of your new record, a copy of the original sampled record, and an isolated copy of the sample in question. Providing extra details, including the release label and size of the release, will help them evaluate your proposed use and speed up the process. The publisher is then in a position to consider price, contact the original composer for permissions concerning moral rights, and start negotiations over copyright ownership and royalty splits on the new record. The record company must be asked for permission to use the original sound recording. Master rights have their own price tag, and sometimes artists or labels will simply refuse to give their permission to use a sample — and they needn’t give reasons. If no permission is given, or the price tag is too high, you needn’t abandon your project altogether: as long as you can license the publishing rights, sample recreation companies should be able to construct an authentic–sounding reproduction of the recording. See the ‘Recreation Grounds’ box for more details. The notoriety of the original record and prominence of the sampled work in the new record. Puff Daddy’s ode to Biggie Smalls, ‘I’ll Be Missing You’, sampled the worldwide Police smash ‘Every Breath You Take’, thus sacrificing £500,000 in publishing royalties to its author, Sting. The likelihood of your success with your record. The territory, format of distribution, status of the artist and marketing spend all affect how your new version will be perceived, and therefore how much you’ll be charged for the sample. Contrary to popular myth, samples aren’t billed on a per–second basis like some phone calls — nor are they free when under three seconds long. The overall impact of the sample, together with all relevant commercial factors, means that each sample is evaluated on a case–by–case basis. For the dance producer looking to issue a limited self–release, it’s best to obtain a buy–out of all rights in the sample for a one–off flat fee. This would allow the producer to release the record and not incur further expense were the track to be picked up by a major label or licensed on compilations worldwide. A major artist will be able to charge top dollar for the right to sample their work. They’ll probably expect an advance payment running into thousands of pounds, as well as future royalties of approximately 1–5 percent on every record sold. These additional costs should be factored into your budget for the release. Similarly, a stubborn or opportunistic publisher may demand 50–100 percent of the publishing income for the privilege of using their words or music. 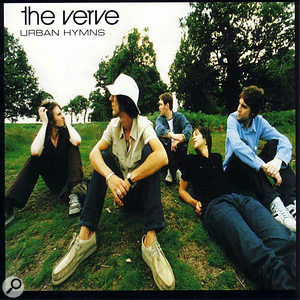 Rock band the Verve learned this lesson the hard way, when following the release of Urban Hymns in 1997 they were obliged to give up 100 percent of the royalties on album opener ‘Bittersweet Symphony’ to Abkco Records. 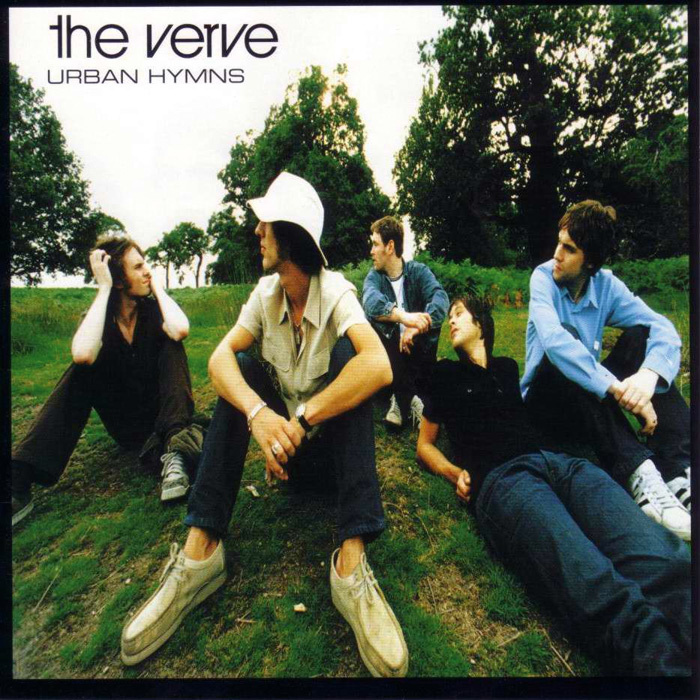 The Verve had sampled The Last Time, a Rolling Stones / Andrew Oldham Orchestra record from 1965. In the court settlement, entire copyright ownership of the the Verve’s song went to Abkco, with full songwriting credit going to Mick Jagger and Keith Richards. Most publishers are more reasonable when approached with sample clearance requests. But bear in mind that it can be a time–consuming process, especially if rights holders are based overseas, or where the track sampled has itself sampled another work. It won’t be sufficient to gain permission for the second–generation sampled work — you’ll also need to clear all original samples. And, of course, where you sample too extensively, it could end up eroding all profits in your track anyway. Should you fail to clear a sample, or not even bother trying, you could still release your record and hope it goes unnoticed — although you’d be in breach of copyright. But what happens when an underground release becomes an unexpected hit? At this point the original copyright holder will crawl out of the woodwork and demand that you recall the record from the shops and pay damages, and if you’re very lucky you’ll be able to re–release the record, only with the offending sample removed. Quite apart from the legal nightmare of injunctions, lost profit, and damages claims, the delay alone could cost you sales and your chart position — a fate suffered by Rui Da Silva, who was sued by BMG records and obliged to remove an uncleared sample of Spandau Ballet’s ‘Chant No. 1’, from his dance hit ‘Touch Me’ featuring Cassandra. Don’t let these cautionary tales put you off sampling, though. Most labels, publishers and artists are only too happy to give their permission to artists looking to re–work their music — for a fee. Moreover, not all unauthorised sampling ends in tears. ‘Tom’s Diner’, an a cappella song written by Suzanne Vega, was known only to fans who bought her 1987 album Solitude Standing. Then, in 1990, DNA sampled Vega’s voice over a sparse beat–laden track. The results were so popular that Vega and her label decided to issue it as an official remix, achieving worldwide acclaim and a top five single. 2 Live Crew making a statement with their bodies.Not all copyright disputes over uncleared samples are resolved in favour of the sample’s copyright holders. One example is the US case of Newton v Diamond (2003). In this case the Beastie Boys had actually obtained permission from ECM Records to sample a six–second, three–note sequence from James Newton’s flute recording Choir. 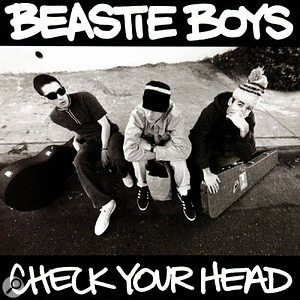 The Beasties then incorporated the sample as a loop into their song ‘Pass The Mic’, which featured on the album Check Your Head. Unfortunately, the composer of the tune, James Newton, sued, as he hadn’t given his permission for use of the underlying composition. Other defendants on the receiving end of sample infringement claims in the US have been able to rely on the defence of ‘fair use’. Fair use is a doctrine not recognised in UK, which permits copying for the purposes of criticism, reporting and review. The aim of the US legislators who enshrined this in law in 1976 was to allow authors to build upon, and transform existing works, but without the requirement of buying a licence to do so. The rights accorded to the copyright holder needed to be balanced with the broader cultural benefits of allowing artists to borrow from, re–work, and comment upon existing works of art. If Andy Warhol could re–work the images of Campbell’s soup or Marilyn Monroe, then a fair use defence would argue that today’s gangsta rappers should be free to sample their source of musical inspiration to produce new and original work. The scope of the fair use defence was explored by the US Supreme Court in Campbell vs Acuff–Rose Music (1994), which concerned 2 Live Crew’s infamous parody of the Roy Orbison classic ‘Oh Pretty Woman’. 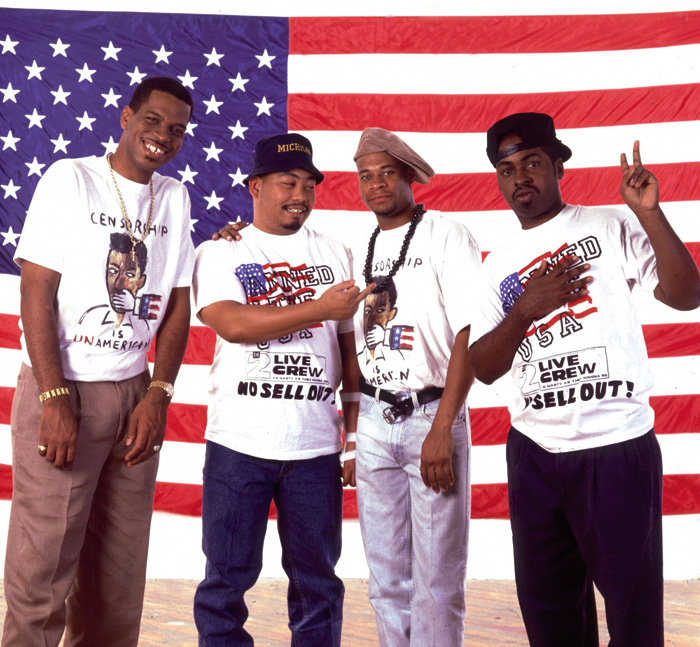 Rather than dismissing 2 Live Crew’s claim on the basis that they’d used Orbison’s music for commercial gain, the court looked at the factors of acceptable fair use, ruling that parody constituted a fair use, despite the fact 2 Live Crew had benefited financially. Guidelines that the court considered in evaluating fairness of the use included the purpose of the use and its commercial potential, the nature of the copyrighted work, the size of the sample taken in relation to the copyrighted work as a whole, and the effect of the sampling upon the market value of the original work. In general, cases of sampling will be more deserving of fair use protection where they represent true creative effort on the part of the producer, and don’t threaten the market of the original record. In this case, 2 Live Crew’s buying public were considered to be of a sufficiently distinct demographic to Roy Orbison’s older fanbase. 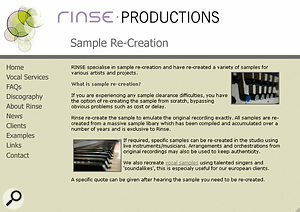 Sample–recreation specialists can help in situations where the owner of a recording can’t be found, or refuses to license it. If the owners of a sound recording flat out refuse to license your sample, or insist on a ridiculously high fee, you could employ the services of a sample–recreation company to work around the problem. 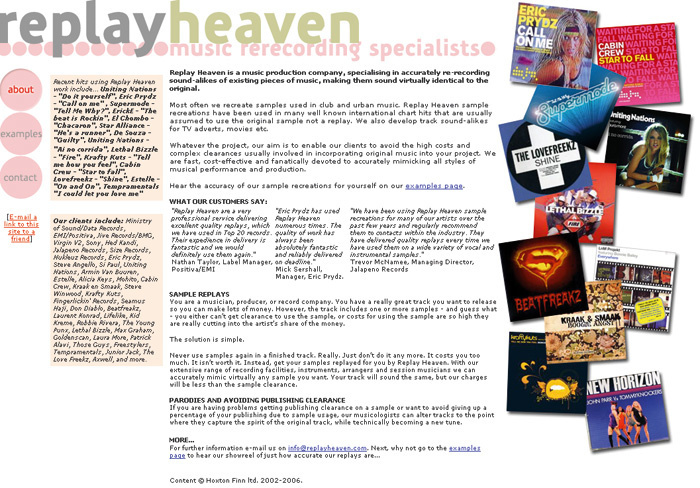 Companies like Rinse Productions (www.rinseproductions.co.uk, or as interviewed in SOS September 2003 at www.soundonsound.com/sos/sep03/articles/rinse.htm) and Replay Heaven (www.replayheaven.com) offer to re–record the chosen sample, and can do so to such a high standard that the original version and the new one are practically indistinguishable. These musical skills have helped secure a string of dance hits for labels like Ministry of Sound, who recently benefitted from Replay Heaven’s recreation of sections of Steve Winwood’s ‘Valerie’ on Eric Prydz’s million–selling dance tune ‘Call On Me’. High–quality re–recordings have the all the hallmarks of the original, but are quicker and easier to clear as there’s only the publisher to consider, and no prospect of stalemate over competing interests with the record label. One such example was the recreation of the Human League’s ‘Don’t You Want Me’, featured in a Fiat Puto ad depicting a lovers’ tiff played out in a Midlands garage forecourt. Talking of re–recordings, there’s been much rumour of late in the press that Wu–Tang Clan have achieved the impossible, and obtained rights to sample the Beatles’ ‘While My Guitar Gently Weeps’, for inclusion on the WTC release ‘The Heart Gently Weeps’. This story has garnered welcomed publicity for the group, but the reality is somewhat different. WTC’s new track in fact includes re–created or interpolated elements of the Beatles’ original. Wu–Tang weren’t able to secure rights to the original master recording from EMI records or Apple Corps, and in fact their agreement sees them giving up 100 percent of all songwriting royalties, simply to re–record the Beatles composition. All publishing royalties will go to the estates of George Harrison and John Lennon, Northern Song owners Sony/ATV, as well as to Paul McCartney and the publishers of his share.